Tourists Guide to the World: Punta Cana, Dominican Republic Edition – The Small Things. I’ve decided that if utopia exists, it is definitely on a beach. The more beach vacations I have the more sure of this I become. Seriously, no body can be unhappy at the beach. Warm sand, sun, cool blue waves, palm trees, hammocks, rum, so much rum. If that doesn’t sound like perfection… let me tell you more! Our beach had these big beds lined with cotton curtains and at lunch time they cooked sea food paella. I brought a book with me and relaxed, slept, tanned, and when I needed some action we played soccer, Frisbee and snorkeled. Pure perfection. Most of our days looked something like this. Wake up, eat breakfast. Go to the beach. Swim. Tan. Swim. Read. Swim. Tan. Lunch on the beach. Swim. Drink. Tan. Swim. Drink. Read. Tan. Around 3:30-4ish we went to the spa. At the spa we used the sauna, the steam room, the cold immersion pool and the regular pool. Afterwards we would rest, shower and get ready for the evening. However, not all of our days were quite so calm. 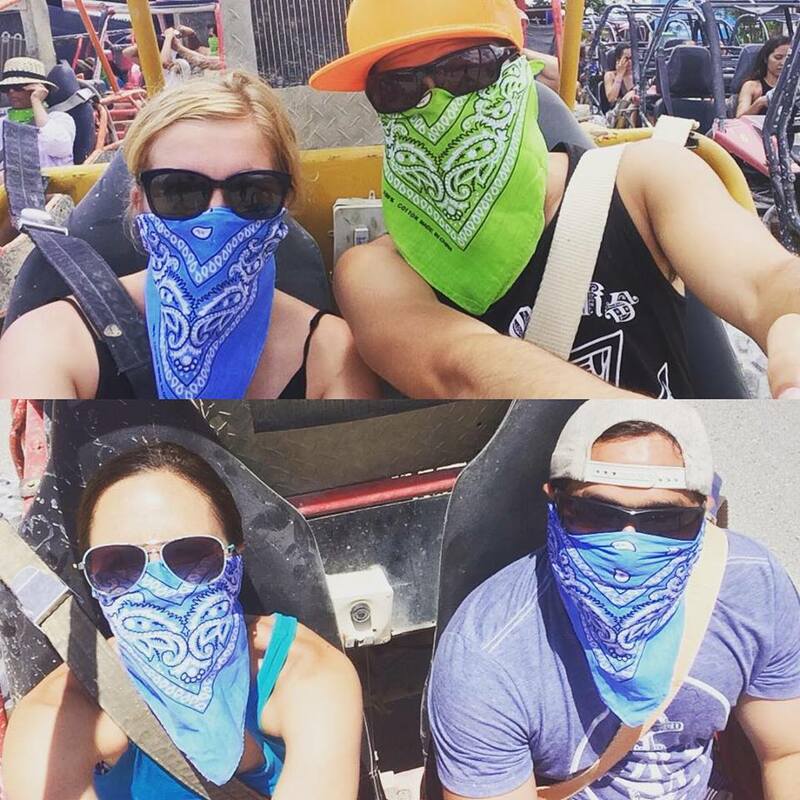 On our 4th day myself, Lucas, his sister Alysha and her husband Ruban went on a dune boogie adventure! This was an off resort excursion and it was such a blast. A bus took us to the dune boogie base camp where we were given protective face gear. Then we were let loose on the roads! Well, not exactly, but we did drive on the open roads. We drove as a very large group to a beach that (I kid you not) was even more perfect than the beach at the resort. Utopia, I’m telling you. Anyway, while at the beach we got some leeche nuts and coconut water. Then out of nowhere this guy put an iguana on Lucas’ head! Naturally I had to get a picture. 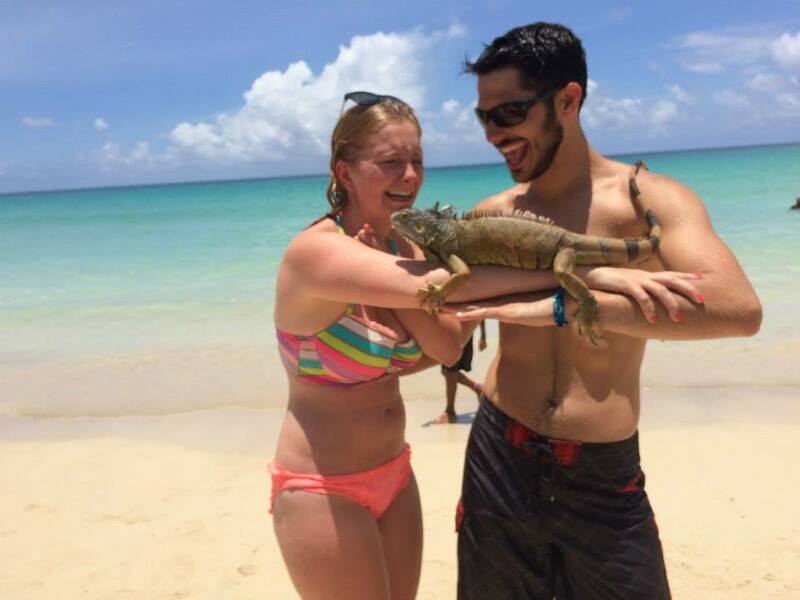 But when I started snapping pictures the iguana man insisted that I also get in the pictures… Here is the thing. I do not like reptiles. The whole situation was a little dramatic. But the photos are hilarious and I will never forget the feeling of his scaly little legs on my arm. Next we drove to a local coffee farm. This place was unreal. They had coffee, chocolate tea, vanilla infused cigars and so much more. I’ve never had coffee that was so delicious. If I was carrying cash I would have purchased a bag to take home with me. Lesson learned. 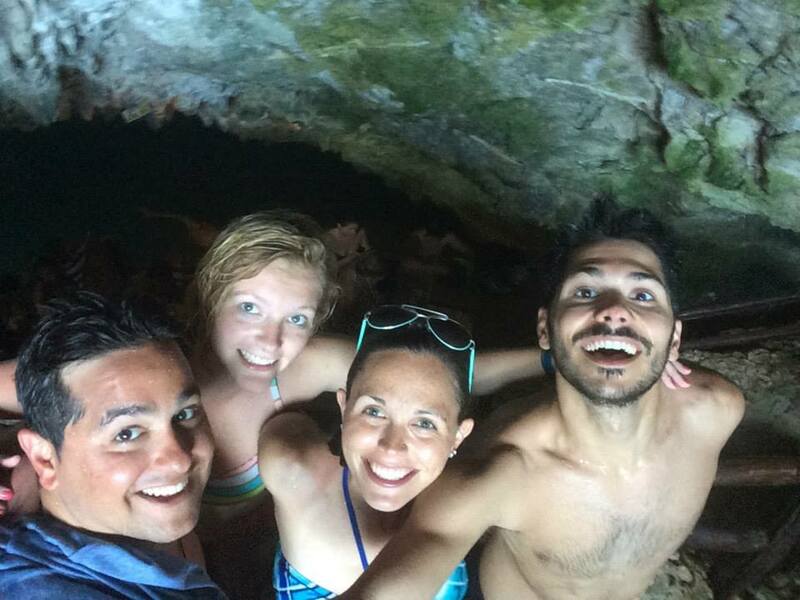 Also on the coffee farm was a fresh water cave to swim in. Fun fact: In Spanish the term for fresh water translates to sweet water. They call it this because sweet is the opposite of salty and fresh water, unlike sea water, contains no salt. Who knew?! After that we journeyed back to base camp and headed back to the resort, just in time for a late lunch. Our second adventure took place at night on our 6th night. 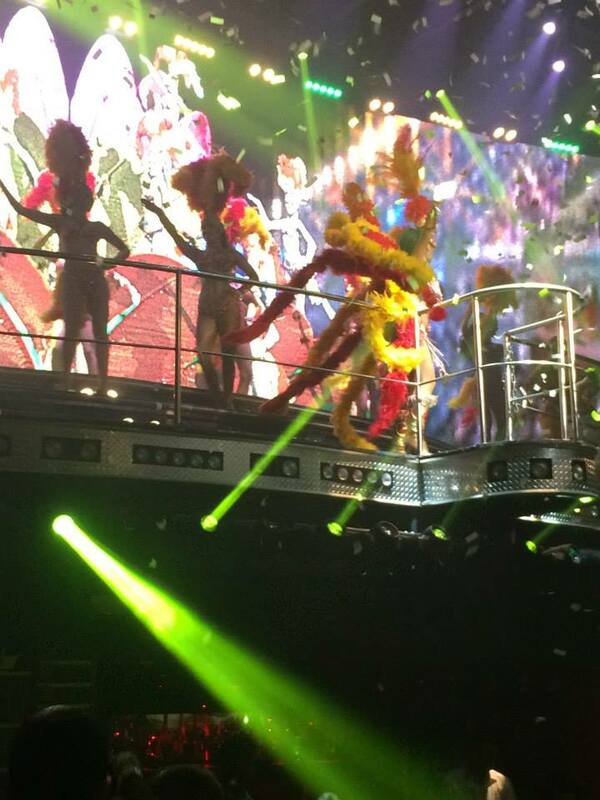 We went to this fantastical, amazing, unreal club called COCO Bongo! Also off resort, so we paid for a package that included a bus to and from the club, the entry fee and bottle service. It is kind of hard to describe COCO Bongo, but let’s just say it is unlike any clubbing experience you’ve ever had before. Basically it is half club, half show. And when I say show I mean singing, dancing, impersonations, sketches, aerialists, acrobatics, and more. It has everything! The format was 10 minutes of show and then 15 minutes of music and dancing. So you were kept entertained but you also got to dance and party. 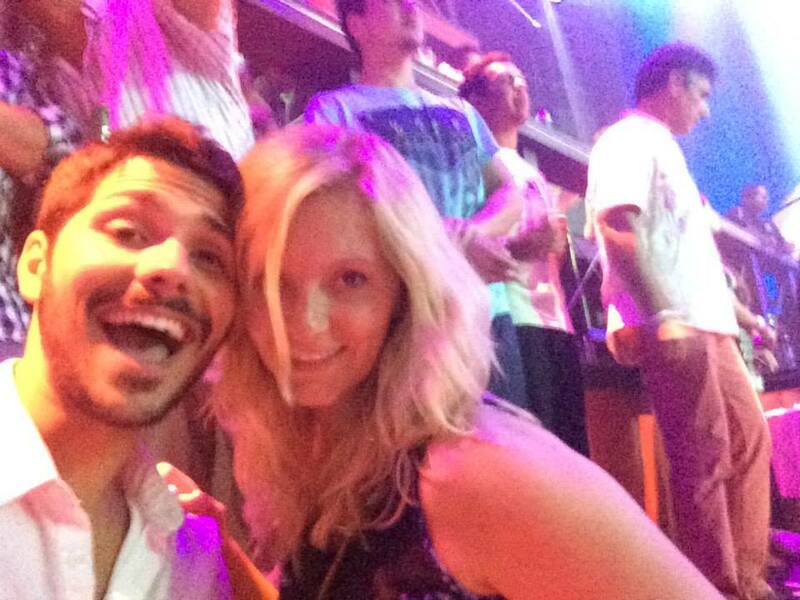 Seriously, if clubbing was like this at home I would go clubbing all the time. I even managed to get in some exercise while I was on vacation. I had to wake up super early if I wanted to get some fitness in because it became hot and humid very early in the day. Still I managed to get in two short early morning runs. Just around the resort. And twice Alysha and I did some beach yoga. Yoga on the beach is one of the most peaceful activities. The sound of the waves rolling in, the sun coming up on the horizon and the whole beach to yourself. It was perfect. Practicing on sand also challenged and improved my balancing skills. I’m going to Punta Cana in a couple of days 🙂 definitely going to check out the club! Do it! It is such a blast! Have fun on your travels! Thanks, Millie! I had the same wind experience in Cuba. So we did the beach in the morning and pool in the afternoon. But the wind at this resort was perfect and allowed me to spend all day on the beach. Which was lovely as I do love the beach. That’s exactly what we did in the Dom. Rep. When we went to Cuba we had no wind problem at all. I think it all depends on which coast you’re on in the Cribbean. I love beaches and swimming, too, but I like to explore places and do lots of trips. We usually alternate the days so we manage both. It might also depend on the time of year, I think. But my knowledge of weather patterns is slim haha. It is nice to keep busy with exploring on those trips. I prefer to mostly relax on my beach vacations and fill my Europe trips with constant sight seeing and tourism. So my next trip will have to be a sight seeing trip as I just had two beach vacations in a row. The ride through the rain forest sounds spectacular! I’ll have to add that to my bucket list! Riding throught he rivers was the best part. We’d had a real downpour the afternoon before and the rivers were rather swollen. The water was right over my stirrups.